“Images of America: Oregon’s Capitol Buildings” focuses on the storied and controversial history of the structures that have housed Oregon state government since territorial days. Most people are aware of the great fire in 1935 that destroyed the capitol, but many no nothing about the suspicious fire that leveled Oregon’s first capitol after becoming a state – a fire that may have been intentionally set, though no one can prove it. Learn about the leaders who championed the capitol buildings and the many models and trials that took place before a brick was laid. I also cover Willson Park which is the area west of the current capitol building and was nearly completely destroyed by a wind storm in the early 1960s. 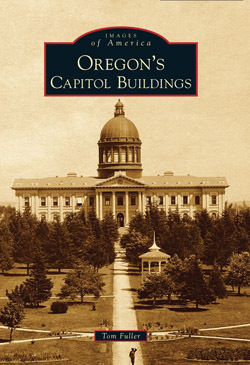 This book should be of interest to anyone who lives in Oregon, has ever visited the current state capitol, or is studying Oregon history. It is available at the capitol bookstore as well as many others around Salem and statewide.